The use of artificial lighting to grow crops indoor has been a revelation to the farming industry. This application of artificial lighting is not the most widespread in India, considering the costs while choosing amidst other hydroponic technologies. Primarily hydroponic crops in India are not grown under artificial lights, but as a hybrid of hi-tech poly-house farming and hydroponics to provide a more affordable option for those interested in getting into this sector. India is a country with plenty of sunlight for the most part of the year, save for intermittent rain in the monsoon. As a consequence, grow lights for commercial hydroponic farming may not appear to be the most viable option. Hydroponic Farming in Tamil Nadu has greatly benefited from the wealth of sunlight the state gets. FutureFarms is a startup that leverages Hydroponics and Controlled Environment Agriculture to provide Turnkey Hydroponic Solutions. These turnkey acre based solutions are done on available flattened land, with the use of “Hi-Tech” poly-house farming and automated hydroponic systems to bring down the cost of hydroponics farming in India. This has enabled farmers to have a commercially viable business model based on Hydroponic produce in the current Indian agriculture market for the immediate need. Indoor farming, in contrast, will be a necessity of the future for hydroponic farming in India. 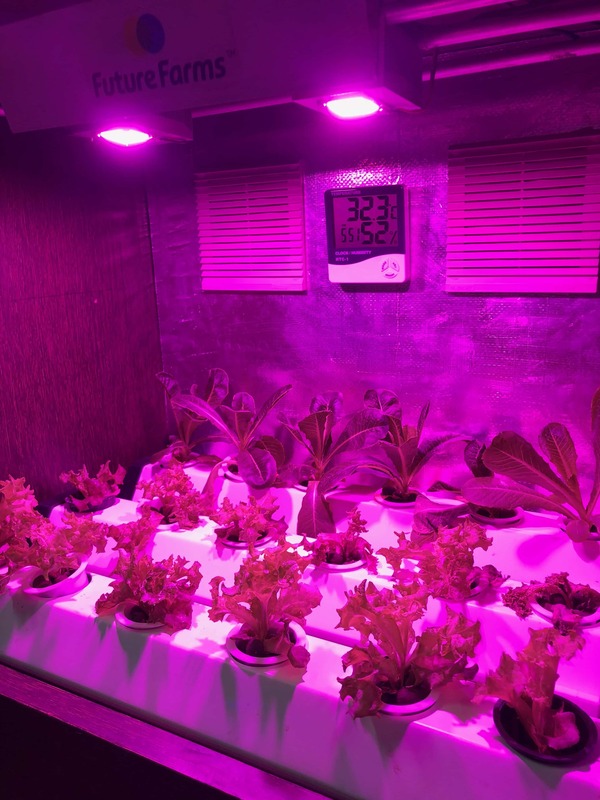 With more migrations to cities from rural areas, Hydroponic farming in Tamilnadu and other states in India will have to turn to hyper-localized food factories in the metropolitan cities for production of food crops, this can only be done with the use of grow light systems, climate control, and hydroponics. Currently, indoor farming has great application in extreme weather conditions, places with low levels of sunlight for a good portion of the year and for super specialized applications such as tissue culture and other biotechnological applications. The MonolithiQ is one such system from Future Farms that can be customized to suit various conditions with specialized application in humid regions. With its inbuilt automatic climate control capability, it can maintain required temperatures consistently. It leverages technology from world-class monitoring and Dosing equipment from Future Farm’s international partner Bluelab from New Zealand and FutureFarms proprietary PlAi (read as ‘play’ for plant intelligence) software. The system is ideally suited to be used in research-intensive applications, as it provides a highly controlled and monitored environment and unlimited potential in data logging required parameters. The MonolithiQ stands as a statement to the technology that hydroponic plants in India will grow in, in the near future. We are currently faced with a Grow light environment that is expensive and unregulated. The current lights use large quantities of electricity and are not the most energy efficient. But with the advent of more efficient and cheaper lighting technology which will bring down the cost of indoor hydroponic farming in India. Combine this with research into the right amount of light for supercharging crop growth. The possibilities are endless when we use indoor farming to take back control of our food. Awesome to apply for indoor gardens. Look like we should invest this system for indoor garden.